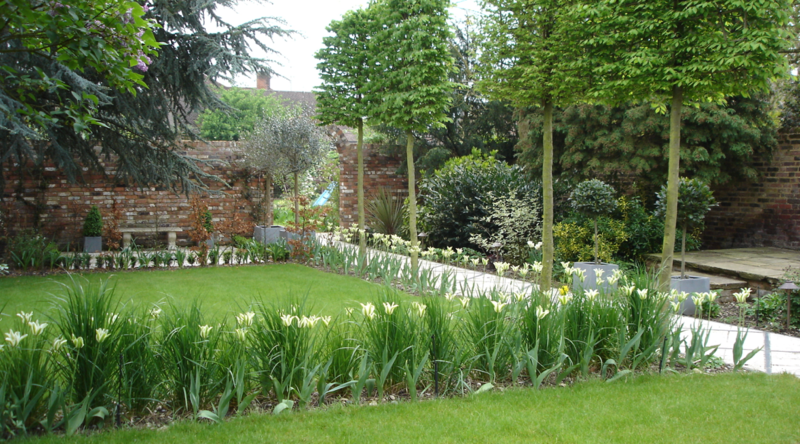 We design and build gardens which suit our clients down to the ground. It’s our job to inspire you, and we’ll start by understanding your aims and objectives. We’ll ask you lots of questions about how you want to use your garden, the elements you’d like included in your design, and how we can make the most of your budget. Our garden design process is a little bit of science wrapped up in a lot of creativity. When we meet for the first time, let’s take a walk around your garden. I’ll make notes about how you intend to use your garden and will scribble down details about the views, levels and direction your garden faces. You’ll have a chance to look through my portfolio and see samples of my work with testimonials from clients. Together we’ll discuss your budget and preferred timescale. 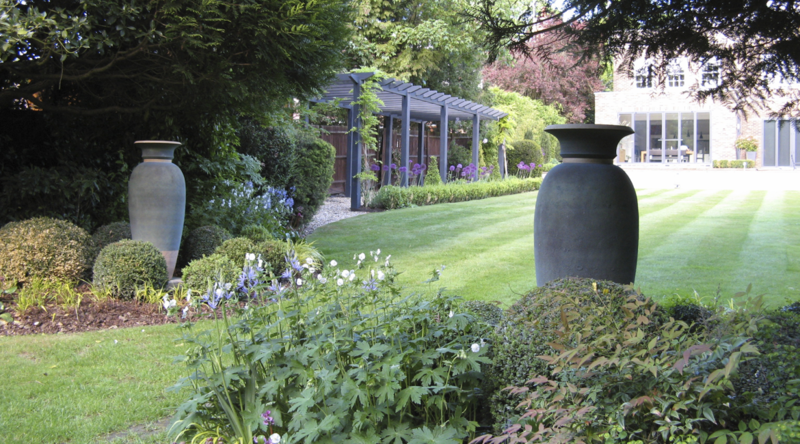 After our meeting, you’ll receive a design brief and a quotation for your garden design work. The next step is to carry out a topographical survey. This is a scaled drawing, which will include the position of the house, levels, boundaries, existing paved areas, existing trees, the position of services (pipes, drainage, etc). We will also undertake a site analysis and photographs will be taken of the garden and its surroundings. 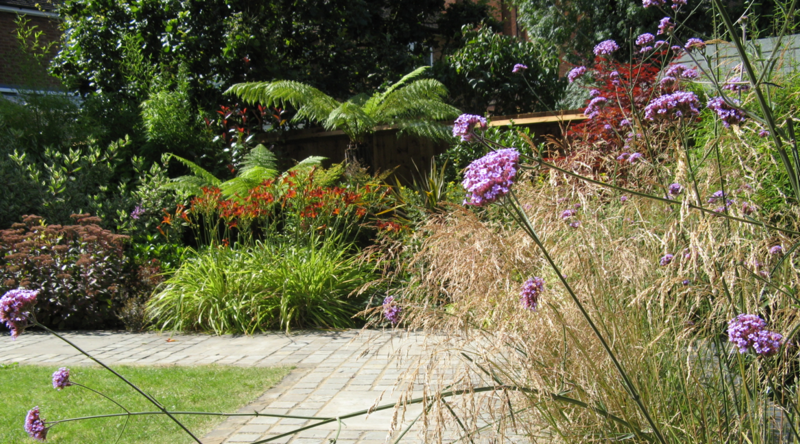 Unless the garden is very small, this will carried out by one of our recommended professional survey companies. Next we will work from your design brief and draw up a scaled 2-D layout plan illustrating the proposed areas of hard landscaping and soft landscaping (plants and lawns) and detailing any changes in levels, walls, steps, water features, and the like. At this stage we’ll meet again to discuss my proposal and make any necessary amendments. Once you’ve approved the plans, I will arrange for final plans to be drawn up. If you have asked us for plants, we will create a 2-D planting plan, showing the exact position of each plant, its species and cultivar name as well as the number required. Good planting design is not just the icing on the cake, but an integral part of our design process. Visual appeal is our first consideration when choosing plants; whether you want a clean smartly clipped white garden, a lush jungle look using dramatic large-leaved plants, or perhaps a traditional cottage garden. We have an in-depth knowledge of individual plant requirements such as soil types, aspect and water availability. So whether your garden is on heavy clay soil or maybe an alkaline free draining site, we will choose plants that will thrive and look fabulous throughout the year as well as provide focal points, enhancing or screening views. Depending on the complexity of your garden design or bespoke features we may need to produce construction drawings to make sure the design is properly executed from start to finish. You might also want to showcase your garden in the best possible light. With the popularity of glass doors installed at the rear of our homes, gardens can look fabulous day and night. At your request, we can add bespoke lighting plans and specify fittings that will make your garden a 24/7 feature. 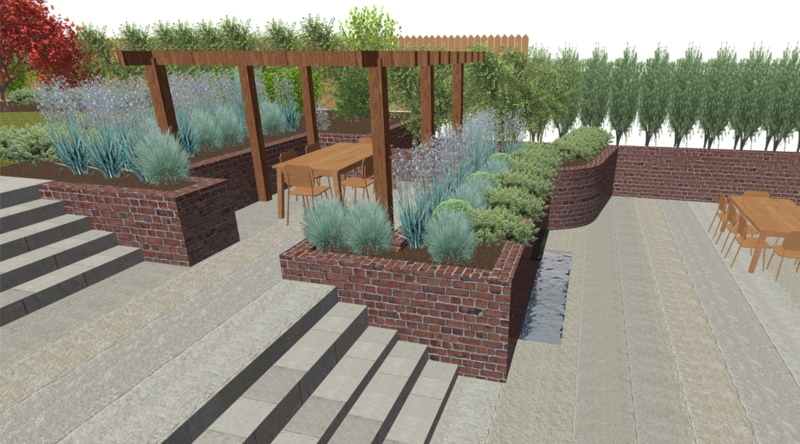 Sometimes our clients prefer to see 3D drawings to help them visualise their new garden. These are particularly useful when working with sloping sites requiring retaining walls. Please let me know if this will be helpful. We are transparent about our charges and will always make sure you sign off extra costs involved in your project before we start work on them. Once your final plan has been agreed, we will draw up more detailed specification documents. These will outline the exact work to be undertaken, and will include precise materials and methods of construction. All relevant drawings will be given to the landscapers so that we offer a fair tender process. With each supplier quoting like for like, you can be sure you’re getting the best value. If required, we can also offer a Project Monitoring service where we will oversee progress and visit the site to check that your design is going to plan. We select our plants from a number of high quality specialist nurseries and plant them according to your planting plan. If you would like additional features such as furniture, sculptures or pots, please ask us to help source these for you from our wide network of trusted suppliers.